In the centuries leading up to World War One, international trade ships traversed the sea lanes, delivering goods — and people — to European port cities. They also picked up a few things along the way — seeds that attached themselves to ballast used to stabilize the ships. 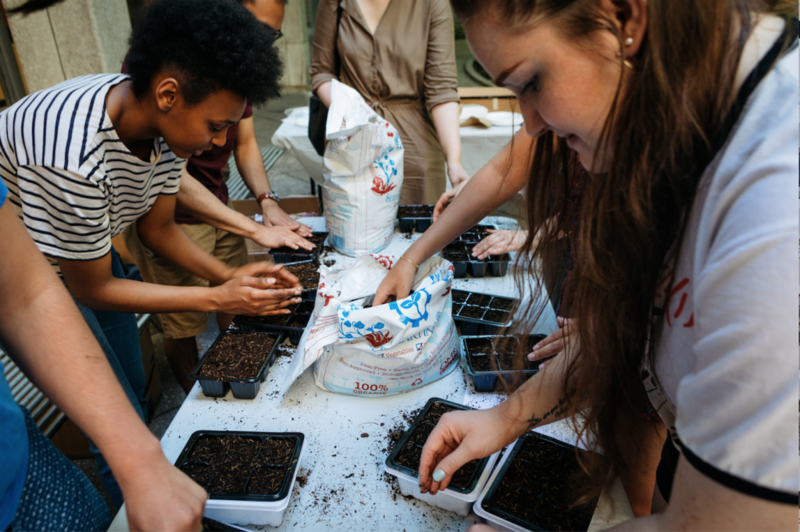 Those dormant seeds were recently brought to the Eugene Lang College courtyard, where New School students gathered to propagate and grow them into plants in their dorm rooms over the summer. The plants will be featured in an exhibition — created by Brazilian artist Maria Teresa Alves and organized by The New School’s Vera List Center for Art and Politics — that will explore ideas of colonialism, slavery, and globalization embodied by the ballast seeds. The exhibition, The Vera List Center Prize for Art and Politics 2016-2018: Maria Thereza Alves, Seeds of Change — A Botany of Colonization, is an outgrowth of Alves’s Seeds of Change project, for which she was awarded the prestigious VLC Center Prize for Art and Politics in November. The biennial prize honors an artist or group of artists for a project that advances social justice in profound and visionary ways. The exhibition opens November 9 at The New School’s Sheila C. Johnson Design Center Arnold and Sheila Aronson Galleries. Developed by Alves in various cities since 2002, Seeds of Change has taken the form of floating-garden pieces containing plants grown from ballast seeds that she and others have collected. Through the project, Alves reveals contemporary and century-old patterns, temporalities, and instruments of colonialism, commerce, and migration. In planting and caring for the plants, students are not only participating in the creation of the exhibition, but also “learning about an often overlooked history and means of tracing colonial trade,” says Carin Kuoni, director of the VLC. Progress on the project will be reported through a weekly newsletter produced by participating students and Sanna Almajedi, curatorial intern at the VLC, and published on the VLC’s website and social media.